It has been raining for days here in the Netherlands. Autumn has really arrived. It is dark in the morning and even darker in the evening. Mornings are cold, the air high. The jacket has been taken out of it’s summer rest. People coughs and sniffles in the train and I dream of hot chocolate and look for new winter boots. No return, the autumn has arrived. More and more, I find my self appreciating the spring and summer with blue sky and soft winds. But living in Europe gives you the four seasons, no matter if you like it or not. So I better just resign and accept the situation. And eat a lot of warm soup. The begin of the season for the pumpkin, is always a colorful happening. 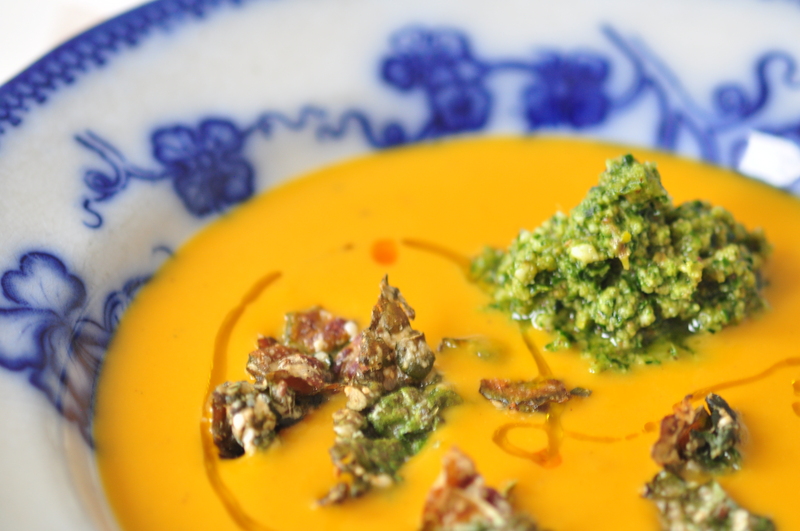 Today I therefor give you a warming recipe with pumpkin soup. I serve it with a pesto made of black cabbage and porcini. Al made of veggies from the season. Always a good feeling. Set the oven on 180 degrees celcius. Peel the pumpkin and union and slice up in smaller pieces. Peel the garlic cloves. Add the vegetables to a oven tray and place them in the oven when the correct temperature is achived. Set the timer for 30 minutes. While waiting for the veggies, prepare the pesto below. Start with chopping the mushrooms in smaller pieces (depending on how strong your hand blender is). Add the porcini to a cup and cover with warm water. The water should cover the mushrooms completely. Let it rest for 20 min. Cut along the nerve of every leaf of the cabbage, throw the hard nerve away. Chop the leafs in smaller pieces (depending on how strong your hand blender is). Add all ingredients to a high blender jug and mix until smooth. Taste, see if you need to add more of anything to get the best taste. When satisfied, let the pesto rest in the refrigerator while you continue making the soup. Add the roasted pumpkin, union and garlic to boiling water and vegetable broth in pan on the stove. Let it zimmer for about 10-15 minutes until the pumpkin is really soft. Use your hand blender and mix the soup smooth in the pan. Add cocos cream or cocos milk and mix again, Add salt and pepper and taste so that you are contempt with the taste. Adjust if not. Serve the soup hot with a spoon of pesto in the middle. Add a few drips of tabasco and a sprinkle of nice olive oil to finish it off. Enjoy! Another option would also be to add some homemade crisps made of black cabbage on top (as in the photo). Recipe soon to be added to the blog.